Even as the debate continues about the place of capitalism in solving the world’s economic problems, the new book, God Is Back: How the Global Revival of Faith Is Changing the World , argues that a free market in religion is where much of the world seems to be headed. The book, by John Micklethwait and Adrian Wooldridge, both writers for The Economist magazine, has gained wide media attention for its confident portrayal of religious expansion and the death of secularism throughout the world. Commentators have noted that Micklethwait and Wooldridge’s earlier book The Right Nation: Conservative Power in America , which was about the growth of the American political right, was equally optimistic about the future of the Republican Party—a confidence that was shaken with the election of Barak Obama. The authors’ views that American-led globalization is also leading to American-style religion has obviously been complicated by the global economic crisis (most of the book was written before the economic downturn), but the book nevertheless provides a fascinating tour de force of contemporary religion. It is no accident that the book opens with an account of an evangelical Bible study in China attended by prosperous and successful professionals. Micklethwait and Wooldridge are convinced that the new frontier for Christianity is China, even reporting that some leaders believe that the country would gain more prestige and power by becoming Christian. The authors move on to show how a wide range of religions and societies are experiencing revival (both in China and the rest of the world)-including various forms of Islam, Buddhism, Hinduism and Christianity in the global south. More likely to be contested is the authors’ depiction of Europe as on the brink of undergoing a reversal of secularism and adopting an American-style religious free market. They cite an upturn in adult confirmations in Britain, a boom in pilgrimages, and most notably, a growth in religious immigrants and their congregations and mosques, as signs of an impending resurgence. The case is made that Europe has now two “religious economies” in operation. The old one consist of state churches that serve as public utilities, providing rites of passage (such as funerals) and other services even for those who do attend church. But increasingly, there is also a new economy based on personal choice, fueling such groups as the Pentecostals, which is now France’s fastest-growing religion. Micklethwait and Wooldridge admit that the European religious free market is marked by culturally-driven demand (or lack of demand) as much as supply. But they note that these indicators of religious interest, especially the growth of Islam, are giving religion a more public role throughout Europe, acknowledged by the likes of President Sarkozy of France, German philosopher Jurgen Habermas, and Pope Benedict XlV. The authors repeatedly return to the role of the US in the global religious resurgence. They see a close connection between the “soft power” wielded by American capitalism and the ways in which American religion is imported and adapted around the world. With their interesting accounts of U.S.-derived Hare Krishna temples in India and African megachurches, Micklethwait and Wooldridge are surely correct in writing that the US factor in worldwide religious growth is significant (and they add that negative reactions to American influence can just as easily spur religious fervor, as in the case of radical Islam). This account depends on the continued strength of religion in its American heartland, but it may be the case that the authors oversell the health and vigor of faith in the US. One does not have to be a proponent of the theory of secularization to spot signs of stagnation and even decline in American organized religion. The growth of non-affiliated Americans has more than doubled since the early 1990s (though the sharpest growth took place in the 1990s). Younger Americans, raised by baby boomer parents, many of whom themselves had cut their ties to organized religion, are more “unchurched” than any other recent generation. The close linkage between evangelical Christianity and conservative politics and the culture wars has been found to have alienated a segment of Americans from churches. Such Christian right non-negotiable issues as gay marriage are finding growing acceptance. The authors display their characteristic confidence in asserting that the “seeking” faith of President Barack Obama will appeal to Americans, perhaps even more than did the muscular Christianity of George Bush, and that the Democrats can build bridges to religious believers. They firmly believe that American religion has a genius for reinventing itself to meet these obstacles. But the ambivalence concerning the religious future and the influence of American capitalism in driving these changes deserves at least some mention. 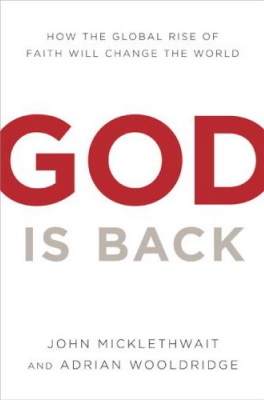 God is Back, however, is a significant achievement that explains a good deal more about religion in its global and American expressions in the last decade than probably any other book out there. Micklethwait and Wooldridge have certainly amassed an admirable amount of anecdotal and scholarly material on religious trends. More often than not, they are on target in their analyses, if not always their predictions, about the complex and unpredictable religious scene.